At this time of year when an innocent wish that someone else enjoy happy holidays can bring down the wrath of some folks, The Legal Genealogist was pleasantly surprised when poking around in court records to find evidence of a more tolerant approach to religion early on in America. The particular document I was looking at was an order to value the property of a minor to determine what its rental value was,2 and the pre-printed form called on the court to name freeholders from the county to set the value. And every one of the freeholders had to take an oath to perform his task faithfully. Except that’s not what the law required. And certainly not what so many of our ancestors did — particularly not if they were Quakers or Moravians or Mennonites or Jews or Muslims or “Gentou” — an archaic term not defined in the legal dictionaries but meaning Hindu. The person about to be sworn should, as a matter of decency, take his hat off, and be uncovered; a Friend, commonly called a Quaker, need not take his hat off, nor need he take his glove off, when he is affirmed, if he does not choose so to do. If the person about to swear is a christian, he must lay his naked right hand upon the New Testament and keep it there while he swears, and when the words So help you God are pronounced, he must kiss the Testament. If the person about to swear is a Jew, he must put his right hand on the Old Testament, and swear “by the true God, the Creator of all things, that you will faithfully and impartially,” &c. and he need not kiss the book — and the words on the Holy Evangels of Almighty God must be left out, and so help you God may be omitted. If the person to be sworn is a Turk or Mahometan, he is to be sworn on the Koran. With regard to the ceremony or form of administering an oath, that form is obviously the best which most clearly conveys the meaning of the oath, and most forcibly impremes its obligation. And since this is not an essential part of the oath, but entirely of human institution, and has varied in different times and countries, though the substance of the oath must be the same in all, it is obviously necessary to allow men to swear according to the peculiar ceremony of their religion, that is, in the manner which they consider binding on their conscience. And so, I swear, happy holidays, folks, whatever you (or I) believe. NOTE: One last time — have you voted yet? Today is the last day and The Legal Genealogist would love to get your vote in the American Bar Association Journal’s voting for the top legal blog in the niche category at this link. Read more about the ABA Blawg 100 here. Thank you!! Awesome. What a great exercise of common sense. 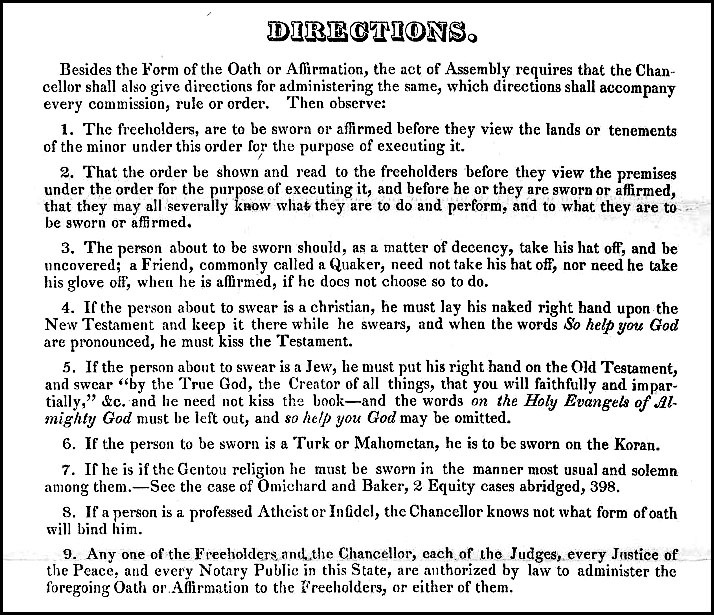 I laughed out loud at ‘But, the directions added: “If a person is a professed Atheist or Infidel, the Chancellor knows not what form of oath will bind him.”4’ How cool it would be if today we could all live and work together with acceptance of the humanity we all share. You hafta love the Chancellor who wrote that part! While I am unable to cite a statute codifying the same, it was common even in the colonial era in areas of Virginia where there were large Quaker communities to allow witnesses to wills, deed, bonds, etc., to “affirm” that they had seen the testator/grantor/etc. sign his/her signature, and likewise those giving testimony in a lawsuit or criminal trial that they were telling the truth in their accounts of what had happened. May have been pure common law and not statute at all, Michael. We’d have to check that to be sure. Judy, This week, in a small public library in Florida, I grabbed up _Thomas Jefferson’s Qur’an: Islam and the Founders by Denise Spellberg. Very appropos to your post, the preface and Indroduction lay the groundwork for yet another forgotten chapter in our teext books, constutution and basic history. In th fall I was in a constiutional semeinar that got me to thinking of religious tolerance. Jacob Henry from North Carolina was a worthwihile essay. I do not want to spoil it for anyone, but TJ does more with Cato than the Prophet in his eventual conclusions. Thanks for your post. Please be careful of how much you rely on the TJ Qur’an book. There is a lot of discussion on how accurately that book portrays Jefferson with respect to his thoughtson the Qur”an. One individual who has written on it is Edward Cline. He has a blog but right now I don’t remember the name. Probably a google of his name would get you to the blog. I’ve been following that discussion, Doug. Most interesting. I love it! How sad that we’ve regressed through the years. We do occasionally seem to take two steps back for every one forward, don’t we? The Colony of New York did it in 1729. Laws of the Colony of New York, ch. 538 (12 July 1729), in 2 THE COLONIAL LAWS OF NEW YORK 513, 515 (Albany, James P. Lyon, State Printer, 1894) (General Assembly naturalized several persons, including Samuel Myer, David Hayes and Judah Hayes. 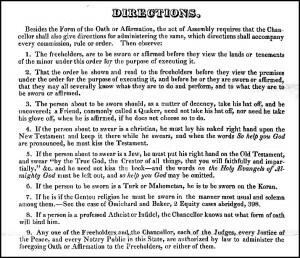 The law specifically allowed them, and all future persons professing the Jewish religion to take an oath that omits the words “upon the true faith of a Christian.”). Not so. By colonial times women were qualified witnesses and often testified in court, particularly in criminal cases.